Arthur and Clare Marshall would like to invite you to the wedding of their daughter Judy to Mr. Alan.. Everyone is invited to witness the lead up to the wedding, including how it is taking six weeks to paint one bedroom, a cleaning lady who loves whiskey and Beetroot wine, a very amorous and sexually frustrated neighbour and a wife who insists on her husband and herself sleeping in separate beds. 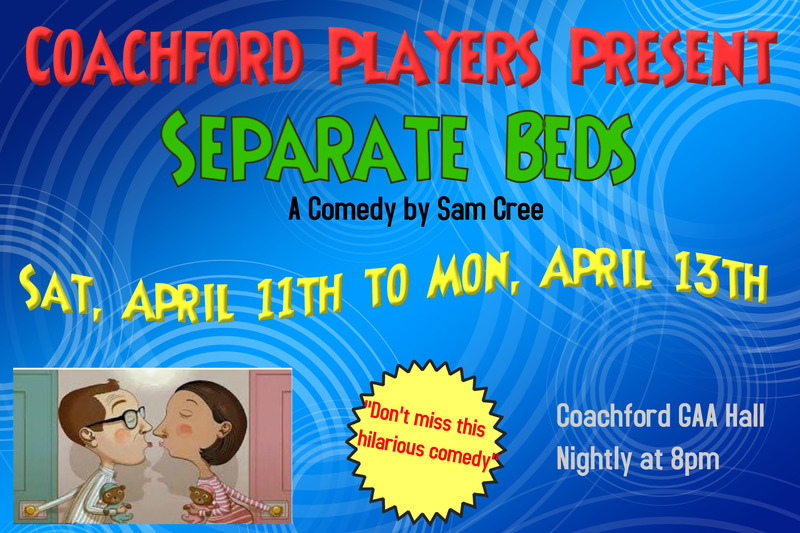 Don’t miss the Coachford Players hilarious comedy, ‘Separate Beds’ Rea on Saturday April 11, Sunday April 12 and Monday April 13m at the GAA Hall Coachford at 8pm each night. Broomhill Vintage Club will hold their annual Vintage Car and Tractor run on Sunday April 12th. Drivers are invited to register at the GAA hall in Coachford from 11.00am where tea, coffee and scones will be available on registration. The Cars will depart at noon and head west to Gouagane Barra via Toonsbridge, Inchigeela and Ballingeary. The owners will regroup and park up for a short while and return to O’Riordan’s Bar Coachford. The tractors will leave Coachford at 12 and head south for Canovee and enjoy a 20 mile run around the highways and byways of beautiful Canovee, Larchhill and Forrest before returning to Coachford Village for hot food in O’Riordans. 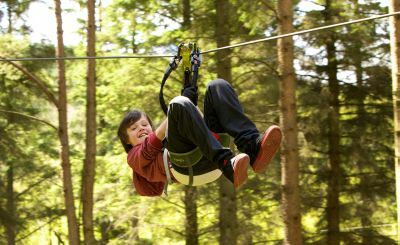 Entry is only €20 per vehicle . Mass of the Lord’s Supper takes place at 8pm on Thursday at St. Patrick’s Church, Coachford. Adoration at the altar of Repose takes place immediately after the 8pm mass until 11pm concluding with Night Prayer. Good Friday begins with morning Prayer at 10am. 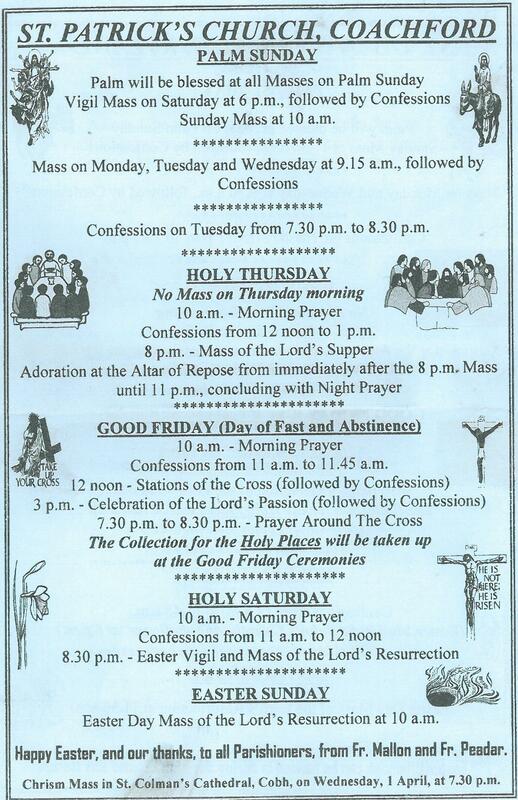 Confessions take place from 11.00am to 1145am. Stations of the Cross begin at noon and these are followed by Confessions. Celebration of the Lord’s Passion is at 3pm and this is followed by Confessions. Prayer Around the Cross is from 7.30pm to 8.30pm. On Holy Saturday Morning Prayer is at 10am , Confessions take place from 11am to 12 noon and the Easter Vigil and Mass of the Lord’s Resurrection begins at 8.30pm. Easter Day mass of the Lord’s Resurrection is at 10am. Fr.Peadar Murphy and Fr. Brendan Mallon would like to wish all their Parishioners a very happy Easter. The Under 14 team entertain Greenwood this evening (Thursday April 2nd) at 6.30pm in the league in Carrigadrohid. The Premier team take on Park United in Mitchelstown on Saturday at 2pm and entertain Grattan United in Coachford on Tuesday at 6.30pm. The B team take on neighbours Strand United on Thursday April 9 at 6.30pm in Carrigadrohid. The present four-year term of the Aghabullogue Coachford Rylane Community Council draws to a close, the council are preparing for upcoming elections in May. Chairman of the council, Willie Dennehy said “This is an opportunity for every member of our community of 18 years and upwards to participate. This can be achieved firstly by nominating persons from your area who you think might contribute as Community Council members, and secondly by voting on Election Day, May 10 2015.” The Community Council’s aims are to Promote the social, economic, cultural and environmental welfare of the area and to develop a spirit of community, neighbourliness and self-reliance, and foster a sense of responsibility for the current and future needs of the community. The council consists of 17 members democratically elected by the community. Nomination papers are available in the three locations below over the coming weeks or can be downloaded from the Coachford News website. The nomination papers should be completed and returned by April 17 to Coachford and Rylane Post offices and Cremin’s Shop Aghabullogue. This entry was posted in Useful Numbers and tagged ACR Community Council, Aghabulllogue GAA, Aghabullogue Coachford Rylane Community Council, Broomhill Vintage Club, Coachford Foróige, Council Elections, Nomination Forms, Separate beds. Bookmark the permalink.